During the somewhat slower months of summer, fourth-year medical student Sherita Holmes can’t see herself doing anything other than exactly what she’s doing — mentoring 25 high school students from underserved communities and helping them experience a taste of the healthcare field. 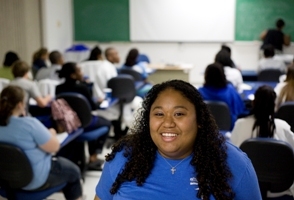 She serves as the camp coordinator for the Health Care Summer Institute, a four-week educational institute at UF’s College of Medicine for high school students from urban and rural areas all over north Florida who have shown interest in the medical field. There are five camp counselors under Holmes’ supervision including two other medical students and one pharmacy student. The camp is directed by Donna M. Parker, M.D., and Michelle Jacobs, M.D., both assistant deans for the Office of Minority Affairs and is organized by the office program assistant Christy Ewing. The Health Care Summer Institute is sponsored by the College of Medicine Office of Minority Affairs, Shands Hospital and the University of Florida Area Health Education Centers. The purpose of the camp is to deepen students’ interest in the health profession by exposing them to various health-care careers — and to prepare them for the process. The camp includes a SAT-preparation class, an introduction to health professions course and the opportunity to shadow health-care professionals at the Health Science Center and in the community. “We give each camper a white coat to help them feel more comfortable when they are with doctors and patients,” she added. Holmes understands the importance of having exposure to the health-care field and mentors while in high school, and that is what she’s hoping the high school students will gain from this camp. “I had a medical student and a resident mentor me when I was in school, and I’d like to do the same for other people,” Holmes said. As part of ongoing efforts to reduce budgets and embrace sustainability, UF has launched “Think Before You Ink"